There is no great mystery in HOW TO BUY A DIAMOND. In the 10 minutes it takes to read the following information, you can possess as much, if not more diamond knowledge than your average diamond sales person. The following guide assumes the Gemological Institute of America (G.I.A.) grading system. This is the worlds most recognized system of evaluating a diamonds quality and value. Each grade describes a different aspect of the diamond and it is only the sum total of all these characteristics which will determine if the diamond is a true gem or just a commercial grade. CARAT means weight (1 carat = 1/5 of a gram) A diamond weight is a very important factor to its cost. The term "carat " originated from the seeds of the carob tree. These carob seeds are extremely uniform in eight and this made them the ideal weight unit for the ancient gem traders. This weight (one carob seed) as later standardized to be 1 carat, or 1/5th of a gram, hence a five carat diamond equals 1 gram and 155.51 carats equal one ounce. The one carat weight is then broken down into 100 equal parts called "points"; 75 points equal 3/4 of a carat, 50 points equal 1/2 of a carat, etc. The significance of the weight is like the other quality grades. Rarity, now by virtue of the diamonds size and weight. Out of 250 tons of diamond ore only a single one carat diamond of gem quality may be found. The value of weight a 100 point (1 full carat) diamond of VS-1 clarity and G body color is generally worth more than an identical VS-1, G color diamond with a weight of .99 carats (less than a full carat). A one point difference in a diamond can make a difference in value. It is important to understand that the weight of a diamond and its physical size are two different things. Even if the only difference between the two diamonds is .01 carat. Take for example two (2) VS-1, G quality grade 1.00 carat diamonds to show the vast difference in value that the cut will make. One of these diamonds could have the Ideal 6.5 millimeter diameter size one would expect to see in for a 1.00 carat diamond. In the other example, the second 1.00 carat diamond may have only a 5.5 millimeter diameter. Because of this one millimeter diameter size difference, and yet the same carat weight, the smaller diameter diamond would be worth somewhere around 20% less than the Ideal cut diamond of the same weight and quality grade. These value differences will vary depending upon the size and quality grade of the diamond you may be interested in. This leads us to the fourth quality grade which is the diamonds cut. Every Diamond belongs in a weight grouping class for a range of weight where the prices per carat for each Color and Clarity group combination are listed. The main reason for this is obviously due to rarity in nature, but current market conditions at any specific time plays a very important role. Some sizes and shapes fall in and out of demand due to what is fashionable or considered affordable in society. Because of this, some size groupings for a given shape may have a higher demand and price per carat than one expects, given its rarity in nature. So to simplify, a diamond in the 1 carat class (1.00-1.49) usually costs more per carat than a diamond less than 1 carat in weight (0.90-0.99). A diamond that is 1 full carat in size, has a higher demand, which causes it to be priced higher. The result is rough stones that could possibly have been cut into beautiful smaller stones are usually cut into not so beautiful 1 full carat stones to get into the higher price range. There are other factors and trade-offs this is just a simplified answer to the reason the cost per carat goes up as the size goes up. COLOR GRADING arbitrarily begins with "D" to avoid confusion. "A", "B", and "C" are assumed to not exist but there is room in the color range to allow for finding them. With grades "A", "AA", or "AAA" how do you know which one is the brightest white color? Diamonds are color graded by a gemologist against a master set of colors. D-F are the finest & brightest colorless diamonds, usually for the discriminating customer who can afford the most beautiful and the rare. G-H are very white & bright face-up colorless diamonds that are not as expensive, and when mounted in jewelry it is difficult to see the a difference between these and the higher grades. I-J are are not quite as bright or have very slight hardly noticeable tint. K-L have a slight tint even the average person will begin to notice. M or Lower the color will be noticed. 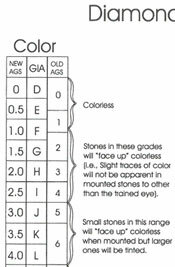 Each grade can have a 10-15% variance in it's price range for a given size group, down to M, and then it changes again depending on the Hue & Color for the Fancy Colored Diamonds. Diamonds occur naturally in all spectral colors, from red to blue, however the most commonly occurring colors are yellow and brown. The amount of color a diamond possesses is graded by an alphabetical scale D through Z. They began at D in case a whiter diamond was later found. Color & Cut are the two factors that influence a diamond's beauty the most. Color should reflect one's tastes and budget. i.e. : You may be able to go with a higher color grade and lower clarity grade to suit your taste and stay within budget. Diamonds of a colorless grade in the D-F range are much more valuable than diamonds in the L-P range because of the rarity of these colorless diamonds. This is not to say that the diamonds in the lower color range are not pretty, they can have just as much brilliancy and sparkle but with a stronger color tone. The effects of color to the cost of a diamond can be dramatic. Two diamonds of the same weight, clarity , size and shape can have a cost difference of over 100% for the difference between an F body color to a J body color. Color can only be graded accurately if the diamond is un-mounted or "loose" and it is highly recommended that the diamond be independently certified for its color as well as the other following quality grades. The color of your diamond will be simply a matter of personal taste and if you don't like the color - just plan to spend more money! Another color factor to consider is Fluorescence, properly called photo-luminescence. Fluorescence is caused by a trace amount of the element boron found in the diamond. It is activated by UV light. Fluorescence in a diamond is usually described on a certificate (GIA, EGL, etc.) as None, Faint, Medium, Medium blue, Strong, Strong blue and Intense Blue. Other colors of fluorescence do occur, yellow and white for example (try to avoid them), but it is the blue we are most commonly involved with. In the old days people used to come looking for the perfect "blue-white" diamond. The blue referred to the fluorescence and the white to the diamonds body color. Some people think diamonds exhibiting fluorescence is out of fashion, but Gems and Gemology (put out by GIA) GIA states that typically fluorescence is a plus in a diamond. Most people feel that fluorescence is beautiful and rare in a diamond, so in a few years fluorescent diamonds may be back in fashion and will demand a premium. If you want a diamond that exhibits fluorescence be sure you examine it under all light conditions, especially direct sunlight and a jewelers black light, since some fluorescent diamonds will actually become hazy in the sunlight and others will glow in a black light environment (including a dance floor) if the fluorescence is Intense (and sometimes Strong). With Strong or Intense fluorescence I advise you to fully examine the stone, each diamond will exhibit its own traits, and in many cases these traits will have a positive effect, often causing the diamond to have a little "extra life" in the sunlight. If you are dealing with a diamond of D, E, or F color, fluorescence is usually a negative since it won't make it look whiter, and may make it look a bit hazy in sunlight. On the other hand, if you are dealing with a diamond in G, H, I, J, or K color, fluorescence is normally a plus, and will whiten the diamond one or more grades, thereby increasing the diamonds beauty and desirability. So to sum up, examine any diamond with fluorescence under all light forms and make up YOUR mind for YOURSELF, as to whether it is a plus or minus. * GIA = Gemological Institute of America. * CIBJO = Confederation Internationale de la Bijouterie, Joaillsrie, Ortevrerie, des diamants, perles et pierres precieuses. In plain terms clarity is simply how much "stuff" is inside the diamond crystal. The less the "stuff" the more they cost. This again because of rarity by lack of imperfection. Most all of the diamonds mined have inclusions that are visible to the unaided eye. A typical retail jeweler may sell a flawless clarity grade diamond once every 10 years, maybe! This scale ranges from F to I-3. 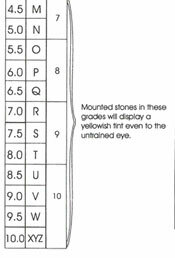 This entire scale can be divided in half, with diamonds that you can visually see the imperfections to the unaided eye, and diamonds that require 10 power magnification to see the imperfections. This division is at the I-1 clarity grade to the SI-2 clarity grade. The I-3 clarity grade will generally contain enough imperfection to dramatically reduce the amount of brilliancy and sparkle and should not be considered for "fine jewelry". However there can even be a good , as well as bad I-2 or I-1 clarity grade diamond. As an example a good I-1 clarity grade diamond would have an imperfection to the side which would be eye visible, however after being set would be covered by a prong or other feature of the setting. 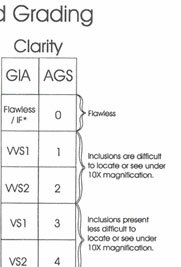 The less desirable I-1 clarity grade diamond would possess a very similar inclusion however because of its location would not be able to be hidden. An eye visible inclusion such as this would later prove to be a distraction to the beauty of the diamond. As with the color of the diamond, clarity is very much personal taste and if you don�t like the number of imperfections - just plan to spend more money! Heating is often overlooked as a source of stress, not to mention the segregation of the metallic system. Overheating, length of heating, and repeated heating encourages grain growth and segregation within the crystalline structure. Isolated heating of strained metal could also be cause of varying stress levels. Careful consideration should be given to cooling rates of heated areas. The source of heat can vary from bench torch soldering to gringing. Notching has been studied at length in application to structural assemblies, and should be applied to jewelry fabrication. Notches and cuts, which come to a sharp angle, are undesirable due to the concentration of stress at the points of intersection. A small radius helps to distribute the stress over a wider area. Compression is a factor rarely considered. Stretching and compression combined, along with quantity of compression, can cause failure. Corrosion is the reduction of metals to a metallic salt. In gold jewelry, aqueous or gaseous environments can cause it. Stressed areas are possible sites of fracture, acting as entry routes for corrosives. Mercury is a great example of wet metal corrosion, as is the exposure of copper-based alloys to liquid bismuth. The liquid metal migrates through the metallic structure, propagating a fast fracture. Chlorine is extremely detrimental to karat metals and should be avoided. Special care should be taken with detergents, cleaners, and other industrial or household formulas. Consider that levels of chlorine and other chemicals can be increased by evaporation of fluids, leaving concentrated deposits. In particular, this makes spas and swimming pools undesireable for gold jewelry. describes diamonds which have no internal characteristics observable under the the same conditions as (FL), but which have minor surface blemishes that do not penetrate the stone. describes diamonds that have very, very small inclusions which are difficult for a gemologist to see at 10x magnification. describes stones with very small inclusions which can be difficult to observe with 10x magnification. Inclusions are barely visible to the unaided eye, except on some larger stones or large Emerald Cuts. describes stones with small inclusions which are usually obvious when viewed with 10x magnification. Inclusions are difficult to see with the unaided eye, except on larger stones or occasionally with Emerald Cuts. describes stones with medium to large inclusions (Piques) which are usually obvious to a gemologist with the unaided eye. An I1 may have inclusions barely visible or located to the side while an I2 will have numerous inclusions that may be centerally located. The Cut is the most important characteristic of a diamond. This factor determines how much light which enters the diamond from above, then how much light will be reflected and refracted back out of the gem to the eye of the observer. In other words how pretty the diamond can be is decided by the cut. For the consumer it is fairly easy to determine in general terms if a round brilliant cut diamond is well cut or proportioned. The first and easiest characteristic to evaluate is to compare the diamonds weight with the proper diameter size listed in the "Size to Weight Ratio Chart "below. If a diamond has a 1.00 carat weight, then its proper diameter size should be 6.5mm. This is the first and easiest characteristic to evaluate. The rest of the characteristics, that are equally important, such as depth% and table%, polish, symmetry can also easily be determined by comparing the information in the tables below with the information provided on the certificate of the diamond you are interested in. 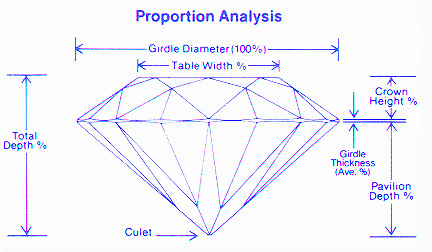 Generally if the size to weight ratio are cut correctly the entire bottom side of the diamond is turned into a mirror. If the cut has been poorly done even the highest quality grade diamond will look lifeless. As an example, in the illustration below, lets assume that each of these diamonds has a carat weight of 1.00 carats. The ideal cut diamond model in the center will have a diameter measure of 6.5mm and will reflect light to its optimum. The shallow cut model on the left will measure approx. 6.9mm+ and will "leak" light. The deep cut diamond on the right (the most common cut) will also "leak" light and measure approx. 6.0mm and have the physical size of a .80 carat diamond. These diamonds are not cut this way because the cutter is unskilled, the cutter buys diamond just like you, by the "carat" and it's his job to return the most carat weight he can in a finished diamond. As in this illustration the "shallow cut" diamond has been cut too wide and shallow for its weight and the light will escape out the back or pavilion of the gem. In the "ideal cut" the diamond has been correctly cut and the light entering the diamond will return to the eye. The "deep cut" diamond has been cut too narrow and deep and again looses the light out the pavilion. Diamonds are cut by the manufactures to yield the greatest amount of carat weight from the rough, which they also buy by the carat. It is therefore in the best interest of the cutter to cut for weight, not for proportions. Consumers are generally not informed about cut and its relation to value, cost, and beauty. Now let's evaluate the cut. This includes the depth percentage, table percentage, crown angles, crown height, girdle thickness, pavilion depth, culet size, finish, symmetry and polish. 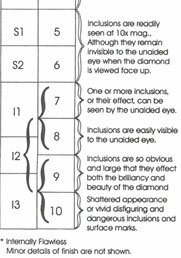 All of these factors are just a simple comparison of the data in the "Typical Diamond Proportion Analysis Chart" below, and with the laboratory certificate of the diamond you are interested in. When ordering your diamond, we will be happy to explain all of these individual quality grades in more detail. The Proportion Tables below will give you the industry parameters for Round brilliant cut diamonds as well as Marquise, Pear, Emerald, Princess and Ovals. Understanding the cut of a diamond is very important, as two diamonds with the exact same quality grades can have a 30% difference in cost because of the cut. Pavilion Angle 40.75 degrees . .
ie: 9mm x 7mm, or, 7mm x 5mm, etc. Many wonder what the difference is between the Princess cut and the Radiant cut... well, they are actually the same cut. The difference is in the shape of the stone. As you can see from the notations above, Princess cut is "1.0 x 1.0, +/- 10%" so they would be very square in shape. A Princess cut becomes a Radiant cut when it starts getting more rectangular. In other words, if the stone measures 7.0mm x 7.7mm (within 10% of being square) it's still a Princess cut, but if it were 7.0mm x 7.8mm, and anything beyond that, it should rightfully be called a Radiant cut. A well proportioned Radiant cut or Emerald cut should be between 1.0 x 1.3, up to 1.0 x 1.4 (example: 7.0mm x 9.1, up to 7.0mm x 9.8mm). Typically the Princess cut also has square corners, rather than the cut corners normally seen on the Radiant and the Emerald cut. i.e: 9mm x 7mm, 7mm x 5mm, etc. i.e: 9mm x 7mm, 7mm x5mm, etc.